So, Brexit has happened. If you are based in the UK, you woke up Friday morning, 25th June, to realise your organisation’s attractiveness as an employer on the global labour market has plunged quite a few points – just like Sterling. Now, we need to make the best of it and in Talent Management just as in most other areas it is about damage limitation in the short term. Insecurity isn’t just bad for markets, it’s bad for workforce performance, too. So, no matter what you expect the final outcome to be, you should act now. For now, this is first and foremost a communication exercise, and you need to build your story, identify target groups and execute on communication. So, here’s an action plan for the short term (watch this space for some longer term points to follow). When is Brexit a Risk for Your Talent Management? Obviously, your organisation is most likely to be affected if you have a large number of employees with EU passports and / or if EU employees hold critical positions. However, as we’ll see, even without any EU talent, there can be a risk (I use “EU” in the sense of “the 27 EU countries other than the UK”). The second factor to make your talent base highly vulnerable right now are strong links to the EU, i.e. if your business is highly dependent on access to the EU market or is a subsidiary of an EU organisation. There are two areas we need to look at: Recruiting and Retention. In both you’ll face some really urgent actions and some mid/long term points to look at – we focus on the urgent stuff right now. The leading theme is to reduce insecurity for candidates and employees and show that you care and that you are proactive. To get started, you’ll need some input from your legal team as well as strategic direction from board level to build your story for communication. In the best of worlds (well: the best of brexit-worlds), you can refer to scenarios prepared earlier. If you don’t have that, you need to take what you can get. The worst thing would be perceived inertia. what is the situation for EU passport holders in the UK between now and the actual exit? what are the possible scenarios after the actual exit? which guarantees can you give? what’s your business strategy for UK based locations? and most importantly: that there is someone they can talk to, if they have concerns. Are there some you’d rather put on hold for now? Are the others vulnerable to EU candidates’ concerns? Contact all EU candidates who have already applied or registered on your platform with the communication discussed above. In times of economic insecurity, few people would want to change into a new job if there is a risk of it being a dead end due to imminent legal changes. If your organisation may be perceived at risk of significant headcount reduction, closure or relocation, then you should provide re-assurance to all candidates. Retention is likely to be your more important challenge. A general message to the whole workforce along the lines discussed above is certainly a good idea. In times of uncertainty, your employees need to get a confident, but not unrealistically optimistic message and somebody to turn to, if they have questions. People named by their line managers to be likely to be affected. Pre-Brexit risk of loss: anybody of the group identified above, who had been considered as having a high risk of leaving already, would probably feature on top of your list. When using a state of the art Talent Management system, you’ll have this data readily available. If not, your best bet would be to get a quick assessment from line managers. Impact of loss: this is a mix of performance ratings, potential, successor pool in case of loss, position held (including project assignments), skills and relationships. Again, most of this data would be expected in a well fed modern system, but chances are there are some gaps to be filled by line managers and project managers. Relationships in particular are dramatically under-estimated and therefore under-documented by many HR functions. Even an average employee would go to the top of your list to avoid short term loss, if he or she is the only person holding relationships to important customers or partners. And don’t forget that the pre-Brexit rating of roles and skills may just have changed significantly. Expertise in fields such as tax, export regulations, or business transformation could be much sought after in the near future. With so many things unknown, the conversations you have can only be the start of a process, but it’s important you do kick it off now. Unchecked uncertainty doesn’t only increase the risk of leaving, but affects performance. You’d rather spend some time on providing your workforce with the information they need than have them all surfing the web to find answers or lie awake at night. You’ll already have realised that you need line managers on board. They need to be engaged and get at least some minimum training to have the right conversations with their teams. You can do this in the traditional way, but having a learning platform and collaboration tool in place can help tremendously. This would also be the tools of choice to manage the communication exercise with the workforce. A couple of simple videos including a message from the CEO and “How does Brexit affect me in my job?” could be produced and distributed easily and a collaboration room for discussions and questions would make things easier. Yes, you can just post the videos in your company intranet. However, a Learning Management System (LMS) allows you to target employees who need it most, specifically and also to track who has viewed them. In the first few days after the Referendum, Sterling fell by about 10 percent to the Euro – depending on which rate you use as a benchmark. Employees, who use another currency that GDP as their reference (typically expats, who expect to go back to their country of origin soon and may even have a mortgage to serve there). If Sterling falls further, compensation packages may have to be adjusted. For new expats sent to other countries from the UK, you may even save some money on their packages. 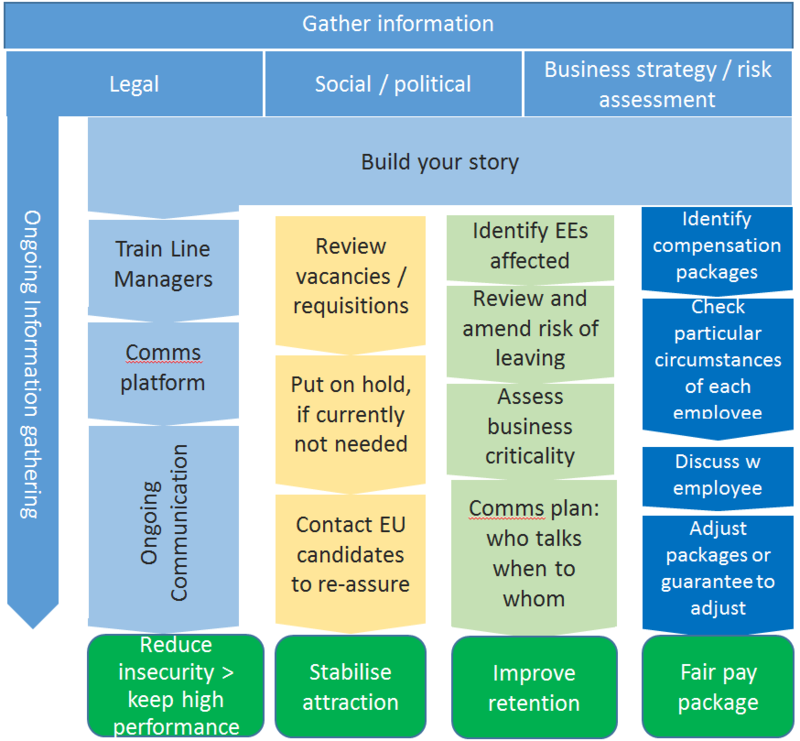 Here are the short term Talent Management activities to minimise the impact of Brexit-related insecurity. We are talking about short term activities, so you need to work with the systems you have already in place. If you realise your systems are not brilliantly suited for the challenge, this could be a very good trigger to get started soon. As you’ll see in the second part of the series, it still relies on world-class systems and for that purpose, a new implementation of a cloud based system could still be done quick enough to help you through the Brexit related phase of insecurity. 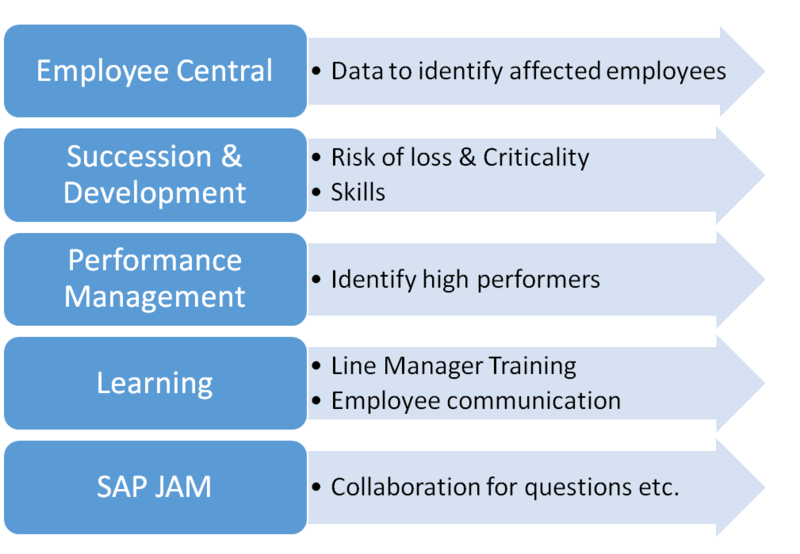 In any case: Talent management has turned out to be a major factor in any crisis, so you should start getting your HCM systems in shape for the challenges to come in the next 3 years at least. Please get in touch, if you need any help to design your short and long term actions, supporting short term actions on the existing systems, or getting your Talent and HCM systems built up for the challenges ahead.